Snickerdoodle. It’s a fun word to say, isn’t it? But even better than saying the word is eating one of those buttery, sugary, cinnamony cookies. Given the popularity of this simple treat, I’m sure most of you know what I’m talking about. But here’s a short explanation, just in case! 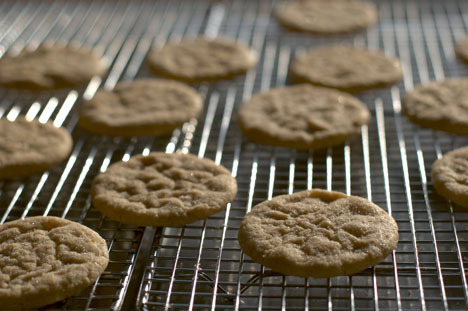 A snickerdoodle is typically a basic sugar cookie that has been rolled in cinnamon and sugar before baking. They have a crackled appearance that develops because the cinnamon sugar coating breaks up as the cookies spread out during baking. Depending on baking time, the texture can range from crisp crunchy to very soft and chewy — it’s just a matter of preference. I must admit that although I have enjoyed many snickerdoodles in my lifetime, I don’t often make them at home. In fact, I don’t remember ever making them. Is it the silly name? Are they just too old-fashioned? I’m not sure. But whatever reasons I had for not making the cookies disappeared when I ran across an incredible recipe for Chai Snickerdoodles at Baking Bites. The recipe is a fresh take on the traditional snickerdoodle and brings a somewhat old-fashioned, out-dated cookie into the 21st century. Chai is the word for tea in South Asia and the Middle East. Masala chai, or spiced tea, is what most of us in the west probably think of when we hear the word chai. Masala chai is a sweetened tea prepared with milk and flavored with warm spices such as cinnamon, ginger, cardamon, pepper, star anise, and cloves among others. So what does spiced tea have to do with snickerdoodles? Well, first of all, I’m sure the cookies would be a nice accompaniment to a hot cup of tea. But Nicole, over at Baking Bites, took this idea a step further by actually incorporating some masala chai spices into her snickerdoodle cookies. It was a brilliant and delicious idea! The ginger, cardamom and allspice add so much warmth and depth of flavor to these cookies that I can hardly imagine going back to the straight cinnamon snickerdoodles of my past. And this recipe almost begs to be played around with. The amounts and types of spices can easily be adjusted to suit your own taste. I followed the recipe almost exactly and the cookies were perfect. The only change I made was to adjust the baking time to 10 or 11 minutes rather than the recommended 12, which resulted in a softer cookie. If you like your snickerdoodles crisp on the outside, bake them for the entire 12 minutes. My husband and I could not stop eating these cookies. Not only were they better than any snickerdoodle I’ve ever tasted, they are right up there in my list of all-time favorite cookies. So if you’re stuck in a chocolate chip rut, freshen up your cookie repertoire with this delicious twist on the classic snickerdoodle. Visit Baking Bites for the Chai Snickerdoodle recipe. I am so excited to try these! 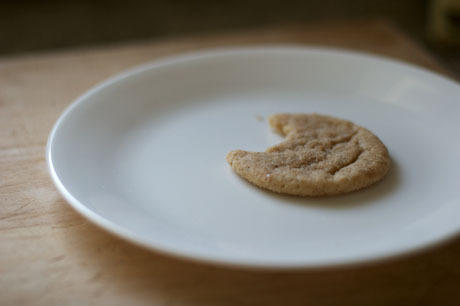 My college roommate introduced me to snickerdoodles via the care packages she received from her mom – they quickly become my favourite cookie. One trick I learned from her mom is to store the snickerdoodles with a piece of bread - this keeps them soft for days to come! Your new site is lovely...so are these cookies. Yummy! WARNING!!! These cookies are like crack, once you eat one you start fiending for another. This recipe sounds perfect for me, the chai fanatic. I made chai muffins once and loved them, so this recipe is definitely going to the top of my to-bake list. Thanks! Hopefully, I will soon be able to taste Masala Chai for the first time and given the spice combo there, I can just imagine how well it will go with these snickerdoodles. Carolyn: Thanks for the tip! Kristen: Thanks! I'll be making some changes to the site soon but I'm pretty happy with this simple layout! Ruby: You should try it! They were easy and soooo good! Christy: Wow, I've never heard of chocolate ones! Mind sharing the recipe? Jason: Yes, I just forgot to list sausage on the recipe ingredients. Weirdo. :-) Justin: Hahaha...how many of these do you think you ate? 20? 30? Marce: I bet the muffins were great! Let me know how you like the cookies! Cynthia: Yes, the spice combination is wonderful in these cookies! Nicole, I love your new "house" - beautiful!! These cookies are calling out my name - I've made snickerdoodles once and they're just delicious. Lovely twist! Jonathan: I think the white russian one sounds good...get to work! Patricia: Thanks! I hope you try these sometime! I am making this RIGHT NOW. The house smells so good! I already tried one and it is wonderful. What a great idea to add all these spices. This is a keeper. I hope somebody else makes this for the holidays. You won't be disappointed if you do.